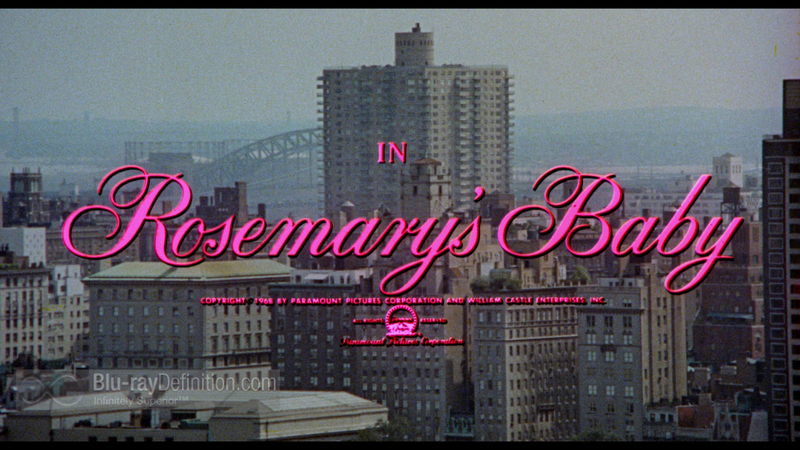 In the movie Rosemary’s Baby, director Roman Polanski uses subtle color play to enhance the mood of the film and to provoke images and emotions. He uses pink (an expressly female color) for the lettering in the title sequence set against a muted aerial shot of the city. The pink swirly letters combined with a female voice “la la” singing gives a feeling of innocence setting up the later premise that the baby is in danger from the murderous witch coven. Polanski used pink words against a muted background. Farrow’s normal attire pale muted tones, here yellow and white. 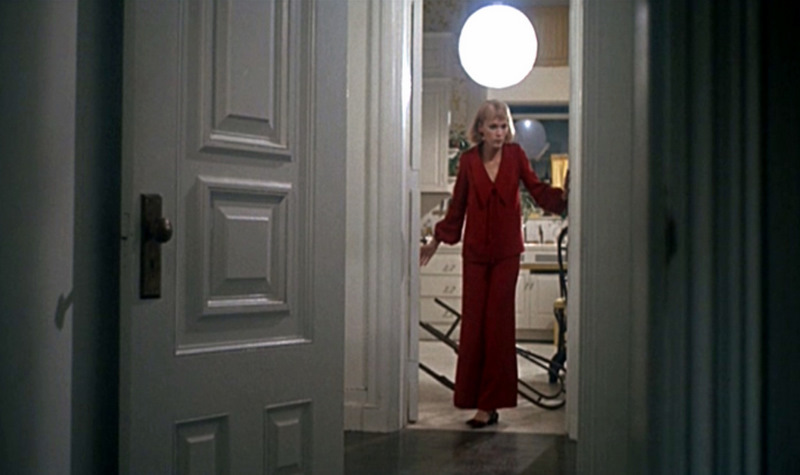 Farrow wears a blood red pantsuit contrasted against the white walls. Throughout the film Polanski uses muted and pale colors for costumes and background, mostly whites, yellows, tans, browns, and beiges. When he uses blues or greens they are pale or muted dark colors, never vibrant. Set against this visual image he throws in pops of brilliant, blood-red. By doing this he creates the subconscious emotions associated with blood without ever actually showing blood (except in the scene where they identify the body of the neighbor girl). I first noticed this trick in the night of conception scene when the drugged Farrow trips down the hall wearing a blood-red pantsuit contrasted against the stark, white walls of the hallway. I then began noticing these small red pops throughout the remainder of the movie; the scrabble tile trays, a handkerchief, cigarette packs, roses, and even red stripes on Farrow’s blue scarf. These pops of blood splattered across a pale background create a visual discordance contributing to the audience’s discomfort. Polanski once said, “I know precisely what I want my audience to see and hear” (http://minadream.com/romanpolanski/InterviewThree.htm). There is no doubt that he wanted these blood spots to be seen, but the question is did he want them to be noticed. Probably not.